You are viewing a gorgeous swivel seat office chair – these really are the classic office chair and are very comfortable to sit in. It\’s the classic tub shape with deep buttons. 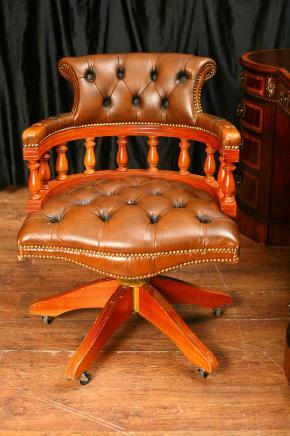 The actual design is modelled on the famous Captains chair which of course get’s the name from the fact that this design was origianlly used on a ship for the captain who could swivel to see all directions. Of course it also makes for the perfect office chair – very comfortable to sit in and on castors so it moves around easily. We also have these in brown and green leather to match your interiors and desks so let us know what you are looking for. This is offered in great shape. Ready for home use right away and we will ship to anywhere in the world. This entry was posted in Leather Desk Chair, Office Furniture, Tub Arm Chairs and tagged leather desk chair, office furniture, tub arm chairs by anti2365. Bookmark the permalink.